Christmas is just around the corner and you should start shopping right away! Christmas is that time of the year when people love exchanging gifts with their loved ones, and if you want to do something special this year then buy personalised gifts for your close friends and family members. If you know someone, who lives in a giant house, which has a fancy garden else loves decorating their house, then these ideas can help you out. Personalised home decors – Who doesn’t like personalised home decors? If you are planning to surprise your parents with some personalised gifts this Christmas, then go for something basic. You can buy cushions with personalised messages or family pictures on them as a décor piece for the sofa set. Other than this, you can also buy table mats with inspirational quotes that your parents had told you about. Photo frames – When it comes to friends or family, you can always get personalised photo frames to take the gift to another level. Make a series of different frames with different family pictures or individual ones and put them together in a box. Make sure you add a cute card too. Other than this, you can also make a collage of the pictures with the names engraved on the frames of your friend or family members. This will add more of the personal touch to the gift. 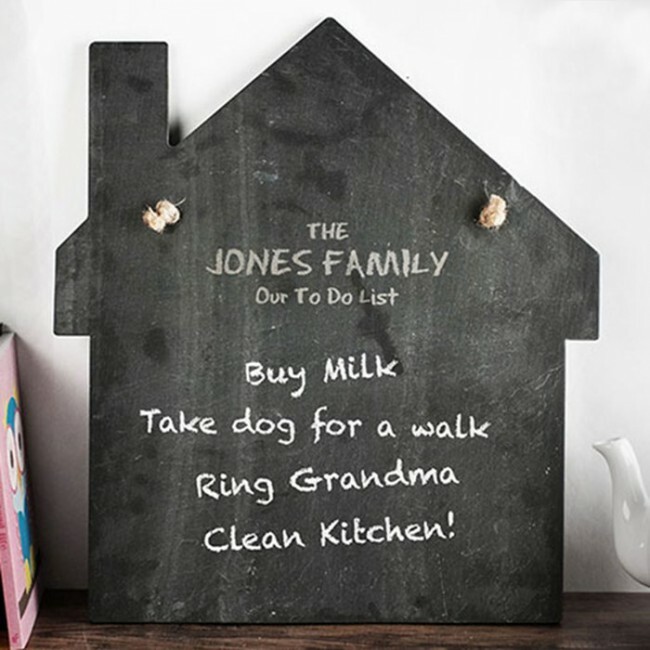 Personalised Slate – Surprise your friends and family with personalised slates as Gift. 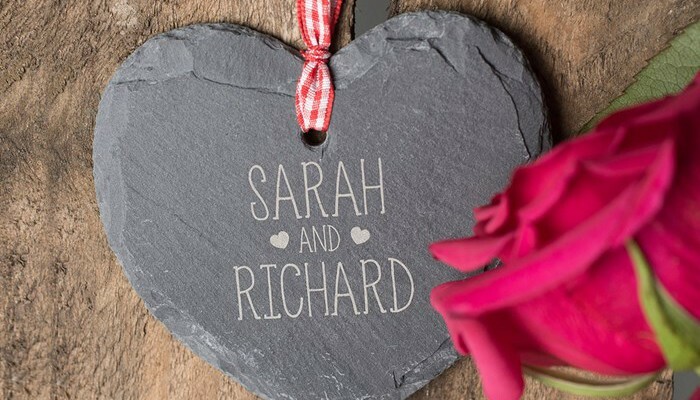 You can buy rectangular slate sign engraved with the message of your choice or adorable heart-shaped keepsake engraved with the couple’s names and love hearts. There are so many other shapes to choose from! Garden decorative pieces – If you know someone who has a fancy garden, then you must give them something special. You can buy a bench and get a saying engraved on the bench. Other than that, you can also have a love quote printed on it if you are gifting it to your loved ones. If you want to keep it simple, then you can give a board, which can be put on the entrance of the garden with the person’s name on it. For example, if your sister’s name is Lily and it is her garden then you can have a cute board that says, Lily’s Garden. Besides this, you can also buy fancy flower pots or other garden equipment, which have names or quotes printed or engraved on it for your close ones. Wall clock – Who doesn’t use a wall clock in the house? People prefer buying fancy and vintage clocks these days to accentuate the look of their bedroom or living room. You too can get a clock personalised, which either has the family name or only a certain name on it. You can find several ideas over the internet when it comes to clocks. There are so many diverse designs in which clocks are made these days. Mugs – This old school idea never fails. If you have no idea what personalised home gift you will be giving someone this Christmas, then simply get mugs personalised. You can either print their names, quotes or photographs easily on the mugs. The best thing is that everyone loves using or decorating with mugs. They can use it as a pen stand, décor item on their desk or cabinet, to drink in it and so much more. So, if you are on a budget, then this gift will work wonders! Calendar – Have tons of pictures that are truly memorable? Well, put it in a calendar then! This is the perfect family gift for the Christmas time. Collect gorgeous family pictures and get a calendar personalised. You can put certain member’s pictures on their birthday months too. For example, if your mother’s birthday is in the month of June, then you can put a picture of the both of you together on that month’s page. These few personalised gifts are no-fail ideas rather terrific enough to make their day special and create memories forever in the hearts of your loved ones.